Greetings Juni in Italy! Happy Pet of the Day! What a beautiful, most precious Peach-faced Lovebird you are, Juni! Your rainbow coloring is simply gorgeous, and your personality every bit as sunny and bright as your plummage! How lucky your humans are, having a feathered family member, a feathered brother, hehe, as beautiful and joyful as you in their lives, having known your love and affection the past 13 years! You truly are a treasure, Juni, a gem, and so very deserving of your big day in the spotlight! Thanks for the BIG smiles, sweetheart! Meeting you today has been a real treat! Hope you're enjoying a very special day of celebration...playing with your lanyards and clips; enjoying some juicy watermelon and a little ice cream; cuddling with your skin sibling; being loved and pampered to pieces! Lots of love, gentle cuddles and wee kisses to you, precious Juni, our very special and most deserving Pet of the Day, EVERY day! What a colorful and curious boy you are. The best friend anyone could have. 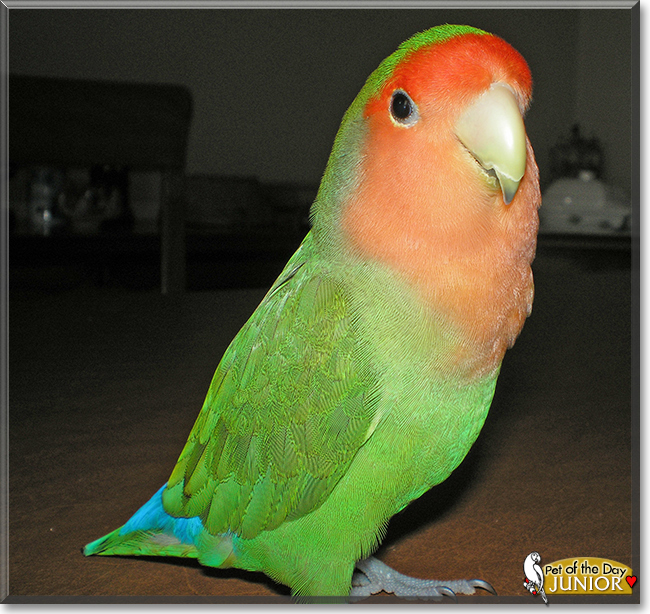 Dearest Junior, what an absolutely stunning Peach-faced Lovebird you are! You have the most beautiful multi-colored feathers and the sweetest face with those lovely big eyes. You look like you are smiling in those great photos, and how cute to see you looking at yourself in the mirror! You have been with your dear family for thirteen years, ever since you were two weeks old. You are like a little brother to your special friend, and you think her/his mom is your mom. You and your family members all love each other very much, don't you. What a wonderful love-filled home you share! Congratulations, darling Junior, on being chosen today's Pet of the Day! We hope you and all your family and friends are enjoying a fine celebration, full of fun and lovies and all your favorite games and treats, maybe even some special watermelon and ice cream! Aww, imagine being afraid of wee Jr.? I should love to have dear Junior perched upon my shoulder and receive a peck of a smooch or two! Okay, maybe it could be a tad scary if you don't expect it it I imagine. All in all Junior is seriously beautiful and adorable, the most exquisite bird and magnificent POTD! What a beautiful Peach Faced Lovebird you are, Junior.